Letters are fast becoming a rarity – the kind written on paper and posted in an envelope with a stamp stuck in the corner. 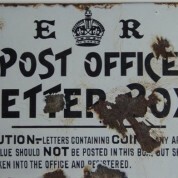 We have lots of other options now -email, facebook, skype – but it wasn’t that long ago when letters were it. Our earliest letters all came and went by boat. Many local mail runs were really mail rows. One ‘run’ requiring enormous endurance and perseverance was begun by Rewiri Ahitapu who lived at Te Rawhiti. When the Cape Brett lighthouse required a regular service, he rowed the mail round from Rawhiti. This incredible man, of slight build, rowed to Oneroa (Long Beach), walked over the hill to collect the mail from the Russell Post Office, rowed back to Rawhiti, then of course the mail had to be delivered to Cape Brett. He would leave on his long row at 2 or 3a.m. to miss the sou’westerly winds, then hoist a sail for the return journey. Another memorable mailman was Capt. Bertie Cook. Bertie was once paid £5 to row the mail from Russell to Whangaroa, then on to Mangonui, back to Whangaroa and on to Russell when the Clansman was unable to do the journey. This sign was found on the site of an old house on the Manawaora waterfront. There was a P.O. Box and telephone at the house for public use until just after WWII. Source: “History of Services by Sea in the Bay of Islands” compiled by Myra Larcombe.